Tory mayoral candidate Boris Johnson has been accused of a "humiliating climb-down" after he clarified comments he had made on the smoking ban. 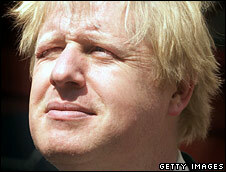 In a web chat he appeared to back an "online referendum" on giving London boroughs the power to rule on smoking. But later he said he was expressing a personal view that such laws should be decided locally and thought pubs were "better places" since the ban. Labour accused him of a "flip flop" and said his policies were "unravelling". In a web chat with The Sun newspaper on Wednesday, Mr Johnson said: "We would have an online referendum in London about whether to give boroughs the power to hand discretion over smoking in pubs and clubs." On Thursday the Conservative Party said his words had been cut back from a full quote, which began: "What is the point of having local democracy if we don't leave decisions like this to a local level? 'If I had my way, we would have an online referendum..."
Mr Johnson, who was paid between £5,001 and £10,000 for a speech to the Tobacco Association in June last year, according to the register of members' interests, said he had been expressing a personal view on how laws like the smoking ban should be decided. "Personally I do not like smoking and believe that pubs and clubs are better places since the ban came in," he said. "It is not within the power of the mayor to have a referendum, nor will I be lobbying for the power to grant one." But Minister for London Tessa Jowell, who is running Labour's mayoral campaign said Mr Johnson had been "forced by his aides into this humiliating climb-down". "This just shows why (the Conservatives' campaigning guru) Lynton Crosby's minders are keeping Boris Johnson away from detailed questioning of his policies. "Earlier this week he admitted the huge £100 million black hole in his bus plans, now he has been forced into a U-turn on the smoking ban." She added: "As another one of his policies unravels, again we see that Boris Johnson is not a serious candidate, he's a serious risk to London's future." The Liberal Democrat candidate Brian Paddick said: "Johnson continues to drop himself in it and his team have to follow him with a bucket and shovel." Ten candidates are competing for the job of mayor of London, which has been held by Labour's Ken Livingstone since 2000.